Volunteer to help prepare food packages for fellow Orange County residents in need and learn about the important work done at the OC Food Bank in Garden Grove. 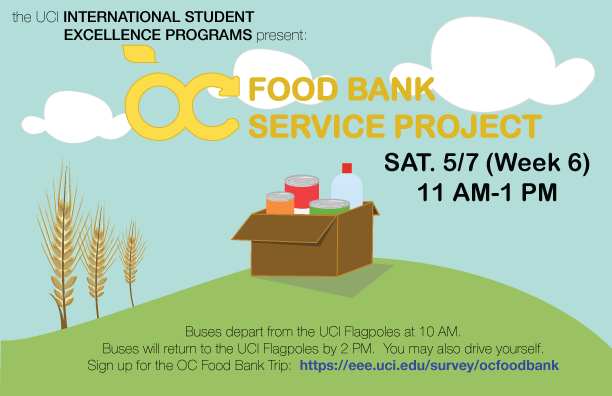 Buses will depart from UCI Flagpoles at 10 a.m. Saturday, May 7. A volunteer debrief and pizza luncheon will take place at the OC Food Bank from noon to 1 p.m. Buses will return to the UCI Flagpoles by 2 p.m. Volunteers also may drive separately. This event is hosted by the UCI International Student Excellence Programs. 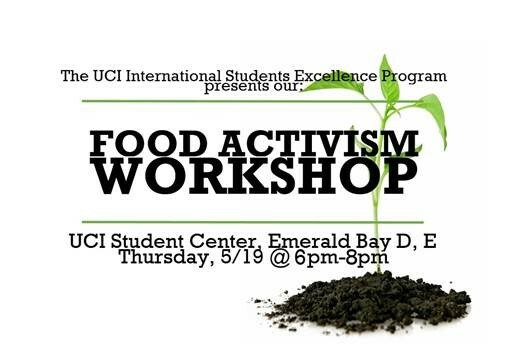 The UCI International Student Excellence Program will host a food activism workshop 6-8 p.m. Thursday, May 19, at the UCI Student Center, Emerald Bay D, E. Refreshments will be served. Speaker: Joann Lo, co-director of the Food Chain Workers Alliance, will speak about how she has incorporated activism and community engagement into her work. In 2000, Lo organized a successful campaign against retailer Forever 21, memorialized in the Emmy-winning documentary “Made in L.A.” She will also discuss her experience with campaigns oriented around healthy, sustainable food. Interactive Component: All participants will have an opportunity to plant seed cups during the workshop! This will create an opportunity for all UCI students to engage in growing healthy, sustainable food. Join your fellow Anteaters by volunteering at the Orange County Food Bank on Monday, Jan. 18. Volunteers will be assembling and packing boxes of food for those in need. Transportation will be provided. 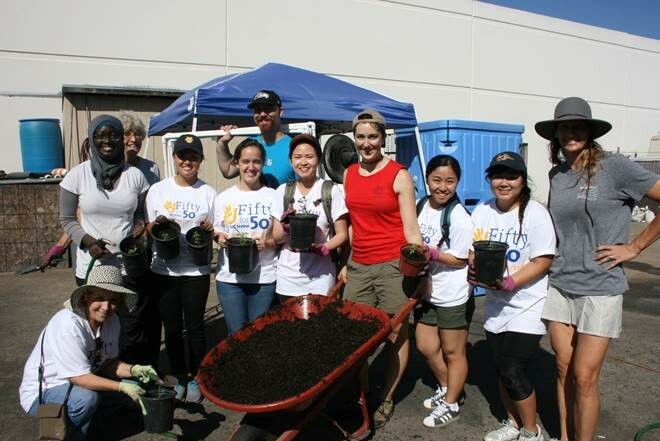 This is also an opportunity to take part in UCI’s Fifty for 50 volunteer initiative and help make a difference in the community, and log your service hours. 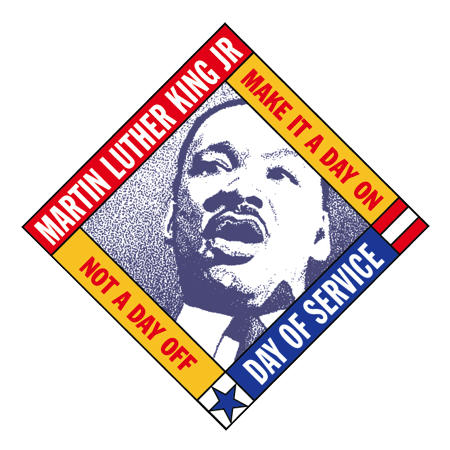 Complete the following three steps to confirm your participation in the Day of Service. Space is limited, complete your registration today! Registration will close when full, first come first serve! • Step 1: Begin your registration by signing up here to hold your spot. REGISTRATION FORM. • Step 2: A $5 deposit is due to Student Life & Leadership, G308 UCI Student Center (M-F, 8am-5pm) to confirm your spot. Deposit is refunded at check-in on the day of service only (non refundable for no shows). Deposit is due by Thursday, January 14 by 5pm. • Step 3: Complete and submit waivers at Student Life & Leadership and receive a confirmation ticket with event details. Waivers are provided at SLL. A social justice workshop will take place upon our return to campus- approximately 1:30- 2:30pm in the Cross-Cultural Center, Dr. White room. This workshop is open to all volunteers that participate in the day of service project. Lunch will be provided during the workshop. For questions or to learn more about this event, please contact Student Life & Leadership at 949-824-5181. The workshop prior to the fair will feature, Ryan Foland from the ANTrepreneur Center, focused on marketing and branding for your organization. The day includes the volunteer fair and a workshop opportunity for community partners. Come join us in our effort of making a stronger more positive community on and off-campus. UCI students will have the opportunity to network with community partners, inquire about volunteer or internship opportunities, and get involved in the community. The fee for the fair is $30, which includes parking table, two chairs, and lunch. Registration deadline is Friday, Jan. 15. Register for the fair and/or workshop here. To learn more about the event, please contact Darlene Esparza at adesparz@uci.edu or 949-824-7759. This program is presented by Student Life & Leadership, in collaboration with Office of Campus Organizations, UCI Career Center, Fiftyfor50 program, Civic & Community Engagement, School of Social Ecology Field Study Program. At this event, we will gather mature native plants that have been grown by volunteers at the Newport Banning Land Trust and replant them in the Crystal Cove State Park. The event includes transportation (unless you notify us ahead of time that you prefer to drive) and a free Fifty for 50 shirt. This event will take place at the Crystal Cove State Park Ranger Station. Please submit this form to make your reservation request. All registrations are due by Wednesday, Nov. 18. You will receive a confirmation email and more details about the event on Thursday, Nov. 19.